This foundation was created in order to network prominent businesswomen in Calgary with women who are just starting their careers. It was created as these businesswomen recognized that there are many obstacles in the path of women becoming successful, and that many of them had strong female mentors early in their careers. The organization helps to pair the new career women with mentors, interview workshops, clothing providers, and even job interviews. We were tasked with creating a visual identity system that was able to show the strength and ambition of young, career-minded women in such a way that invited business leaders to want to contribute and engage in the endeavor. 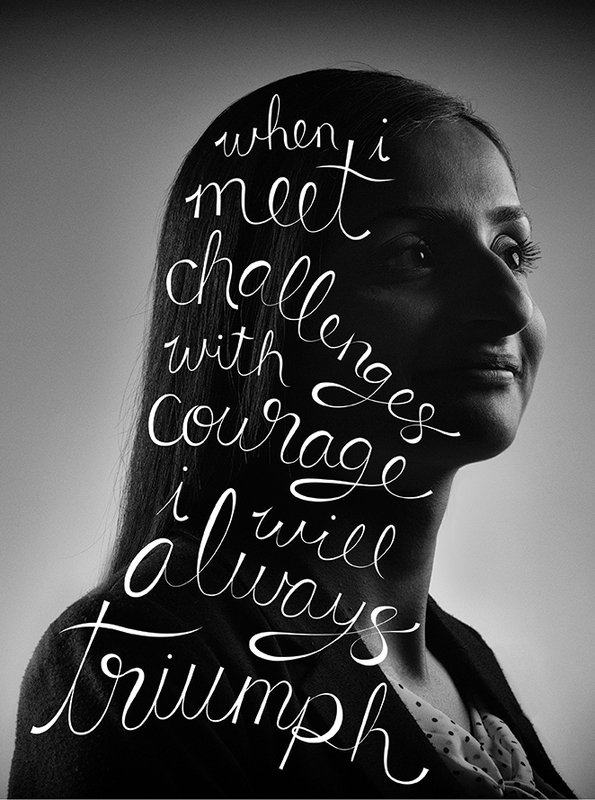 We took the idea of mantras and illustrated the type over high-impact portraits to act as an elegant thought-balloon. The models used were all students who were about to graduate into their career fields. The logo was created to be an accurate visual representation of what the foundation does. The interlocking blocks are representative of how a strong network connects and raises the people within it. We wanted a strong bold icon to make the organization easily identifiable. The fully responsive website was used as an informational hub to provide potential donors with all the tools they'd need to host a successful fundraising gathering or to have a presence at a local event. The site also used social media aggregator Stackla to capture all the instances of the #1kwr tag. Part of the project also included producing a video that followed a young woman who had come to Calgary from Russia to start her career. Lidia thought she was assisting the foundation with a video that would be used for donor outreach, but at the end she was surprised with the job that she thought she was acting for.